If this doesn’t tell you how hilarious this competition is, I don’t know what does. All the gentlemen competing were there to have a good time. They put their inhibitions behind strutting their stuff and showing some leg – and some as you will see, upper thigh! The contest, which is usually held outside, was brought inside due to the rain which limited the theatrics of the contestants, but this did not deter the crowd! The store was filled with people and authentic music. The $5.00 registration fee went to cover bagpipers who piped out the runway music which complimented the bellowing laughs and cooing audience as legs were kicked and pints passed about. Donegal Square is connected to McCarthy’s Red Stag Pub and Whiskey Bar which was serving tasty Irish coffees and pints of Guinness – perfectly poured with the shape of a clover in the frothy head. 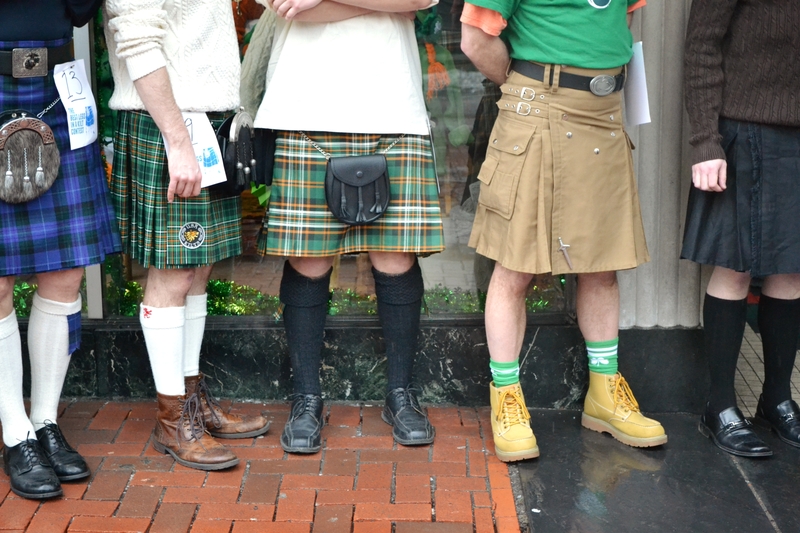 The key to the Kilt Contest was to stand out. Some notable contestants included: A young red haired boy sporting Spiderman high socks, the gentleman with a garter belt of green carnations, and a father-son duo. The winner of the contest won an 8-yard polyviscose kilt (a $149.00 value). The following day, the other set of hairy legs were out on all fours! 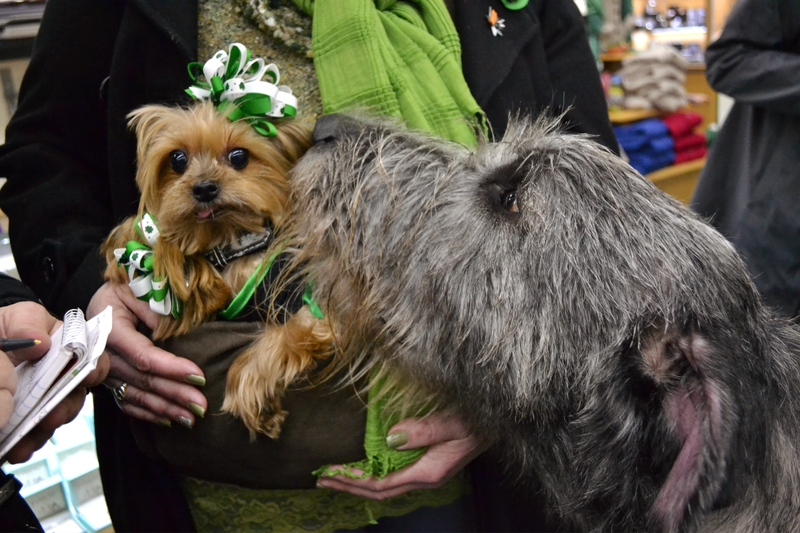 Donegal Square was a sea of fur and shamrocks, a dog lover’s heaven as you spotted an Irish Wolfhound towering over teacup Yorkshire terriers. Later the Yorkies dawned green tutus and the Irish Wolfhound, named Connell Daley and seemingly the Donegal Square mascot, dressed as the McCarthy’s Red Stag in the parade. 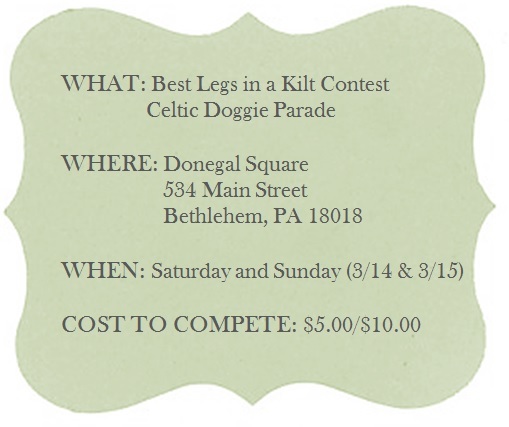 The registration fee for this competition benefited The Center for Animal Health and Welfare in Northampton http://www.spcanorthampton.org. As I learned, they are a private non-profit and no-kill shelter in the area. 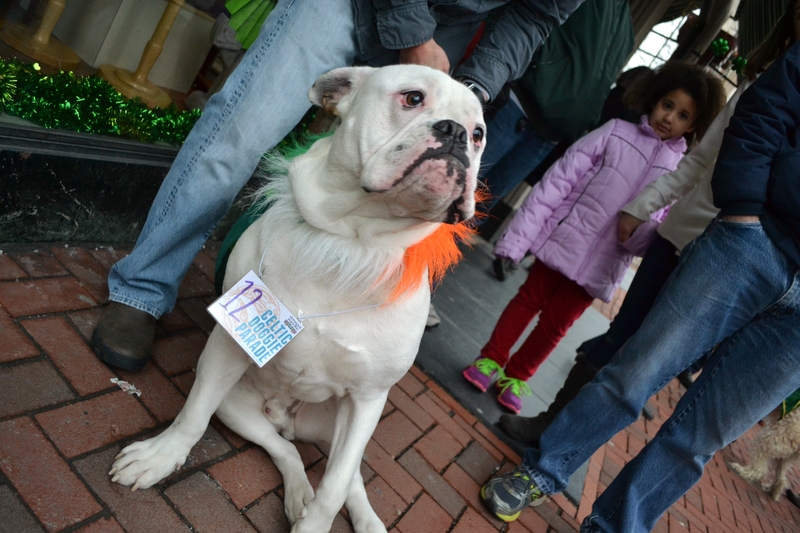 So if you are looking for a new family member and a future contestant of the Celtic Doggie Parade, there’s the place to start! Dog/owner look-a-like (or “doggleganger“, if you will). 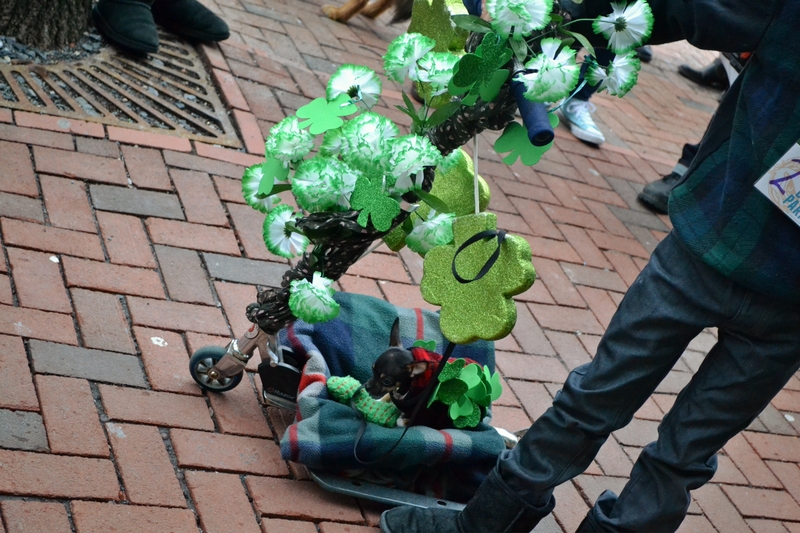 A notable winner was the smallest dog, a chihuahua named Sparky, who rode on a shamrock covered scooter down the sidewalk. As to all the losers, don’t terrier ‘self up, there’s always next year!